Bridging the gap from VGA to HDMI, the Atlona HDVS extender/scaler products are designed to smooth the transition from analog to digital sources in school and corporate applications. While some systems use HDMI computers or document cameras, there are still numerous VGA computers in use today. The HDVS extender/scaler products are designed to support both analog and digital sources.The components can function as a complete system, offering switching, scaling, and control within simpler systems, while for larger and more complex applications such as videoconference and telepresence facilities, the components enable both HDMI and VGA/analog audio input to larger switchers. 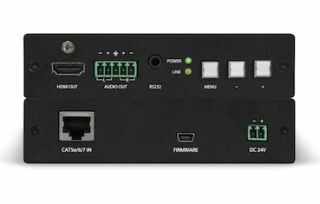 The HDVS receiver also scales an HDBaseT input to an HDMI output to guarantee compatibility and features balanced audio de-embedding for simpler connections to sound mixers. Atlona HDBaseT matrix switchers complement and complete HDVS system setups.